Busch Stadium is where St. Louis Cardinals (MLB team) call home. It is the replacement stadium for the old Busch Memorial Stadium. This new stadium sits on part of the former stadium’s property. The new stadium, which has 3,706 club seats and 61 luxury suites, hosted the 2009 MLB All-Star Game. The opening game for the new stadium in 2006 was between two minor-league teams. The Springfield Cardinals beat the Memphis Redbirds by a score of 5 to 3. These teams are both part of the St. Louis Cardinals system. The first game for the St. Louis Cardinals at the new park was against the Milwaukee Brewers on the 10th of April 2006. The Cardinals won 6 to 4. 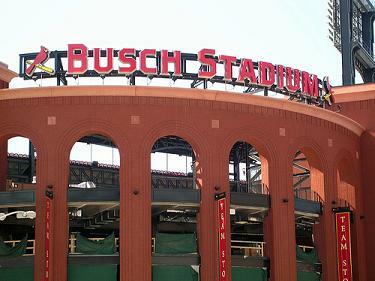 The new Busch Stadium is the latest of three stadiums to carry the Busch name. The first was back in 1953 when the Cardinals’ organization renamed the Sportman's Park as Busch Stadium to honor the Cardinals’ owner Gussie Busch. The Cardinals shut it down in 1966. The second was in 1996 when the baseball and football Cardinals teams both moved into the multi-purpose Busch Memorial Stadium. 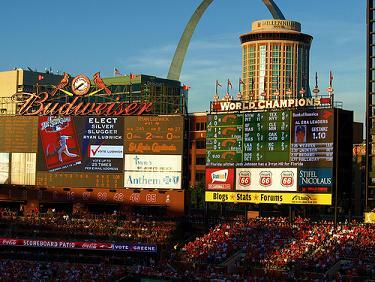 Then the St. Louis Cardinals moved into the current baseball-only stadium as of April 10, 2006. In 1995, the St. Louis Cardinals desperately needed a new ballpark and therefore, began lobbying the city for a baseball-only stadium. Unable to acquire funding for a new stadium after several years, the team started looking at other cities to relocate. However, the city of St. Louis had a change of heart and came up with a funding plan to construct a stadium downtown. The funding plan involved private bonds, a long-term loan from St. Louis County, bank loans, and money from the owners of the team. The cost of developing the Ballpark Village and stadium was approximately $665 million, with the stadium alone costing $365 million. The Cardinals chose HOK Sport (now Populous) to design the new stadium and Hunt Construction to build it. HOK Sport designed other notable stadiums such as Jacobs Field and Sydney Olympic Stadium. In March 2006, in preparation for the season starting in April, the groundskeepers laid the natural grass and the maintenance team installed the Daktronics LED system for scoring and video. The display for the video was 32 feet high and 52 feet wide. For opening day in 2006 the seating capacity was 9,150 in the terrace level, 3,661 in the bleachers and 16,880 in the field level. These seats along with standing room of 2,751 gave the stadium a total capacity at that time of 40,713. Later on in May 2006, the team installed the rest of the seating increasing the seating capacity to 46,861. In the first season of the new stadium, the St. Louis Cardinals sold every game out. This set the season attendance at 3,407,104 (second highest attendance all-time for the ballclub). The ballclub went on to beat this mark in 2007 and 2008. New Busch Stadium, in its first year, hosted the 2006 World Series between the Cardinals and the Detroit Tigers. The Cardinals won the first three games of the series, and went on to win in five games. This was the Cardinals 10th World Championship. New Busch Stadium joined a very short list of ballparks whose team won the World Series in the ballpark's inaugural year. Moreover, the Cardinals were the first team to win a World Series at home in the inaugural season of a stadium since the 1912 Boston Red Sox did it at Fenway Park. The Yankees repeated this in their new stadium in 2009. In 2009, the Cardinals hosted the MLB Baseball All-Star Game on July 14th. The American League beat the National League 4 to 3. President Barack Obama threw out the first pitch. The field dimensions of New Busch Stadium are 336 feet down the left field line, 400 feet to center field and 335 feet down the right field line. 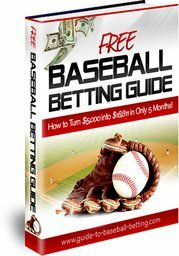 If you're considering going to a Cardinals game, Buy and Sell Tickets Here!